I love polka dots too! I have a new yellow polka dotted cardigan I can't wait to wear when it gets a little cooler. And I don't think I would have thought to wear dots on dots in opposite colors, like picture 5, but I like it. Not the biggest polka dot person but those ballet flats are adorable!! I do love some polka dots! I'm a polka dot fan and I think it's great they are a rising trend. Love those ballet flats! Definitely a DO! Super cute! I've got to have that old navy sweater! I have tons of polka dot items in my closet. I actually got my two favorite pieces (a top and a pleated skirt) at a thrift store. 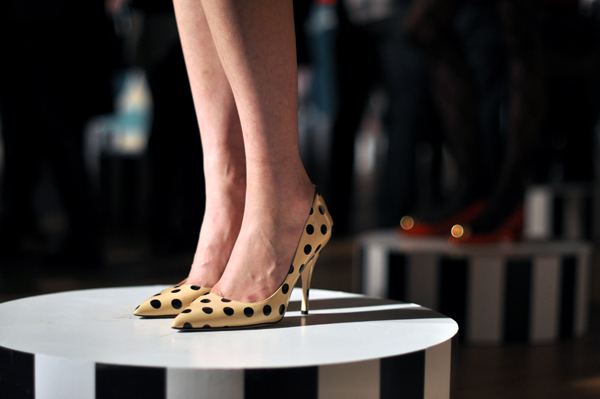 Polka dots have been around for so long that it's the perfect pattern to thrift! I do love those Anthro jeans though. I wish I could justify the cost. LOVE the polka dots too! My favorites are those subtle gray pants - adorable. I'm (a little bit) obsessed with polka dots. Love it!! :) And LOVE those shoes! i do too! i love them on flats like the picture above. Love it all!! New GFC follower, follow back?! I just bought that Old Navy sweater so I'm glad to see someone else wearing it (I need the inspiration!). And I'm with you - love everything Joy wears, she has the best clothes! I definitely need some polka dots added to my wardrobe. I'll have to find something that's versatile!